Recently my room has been getting just a tinsy bit of a make-over. Many times have I swapped where the furniture sits and changed the photos on the walls, but this time, I gave my little area a re-vamp from top to bottom. 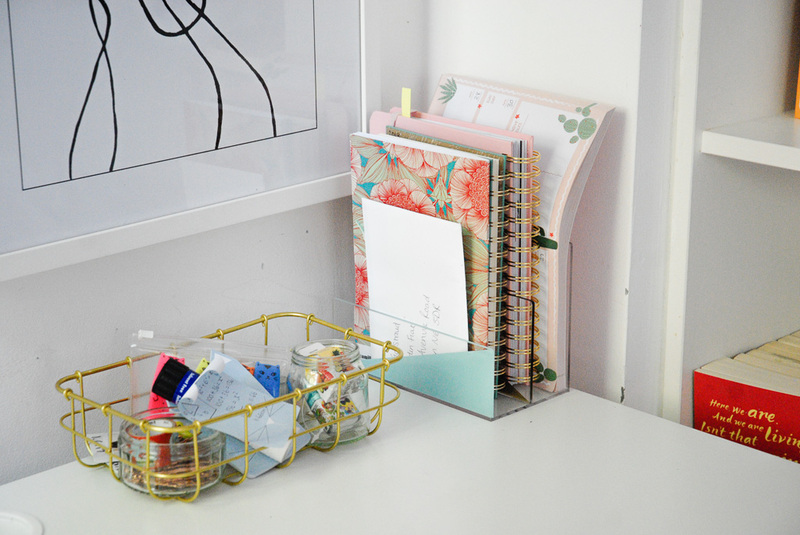 For me, having a tidy space that inspires me is essential. I haven't always been like this, but lately my inner Monica Geller hasn't even let me sit down to write a blog post unless my rooms is spotless. So, I've given it all a small change. And if I'm honest, I do really love it! 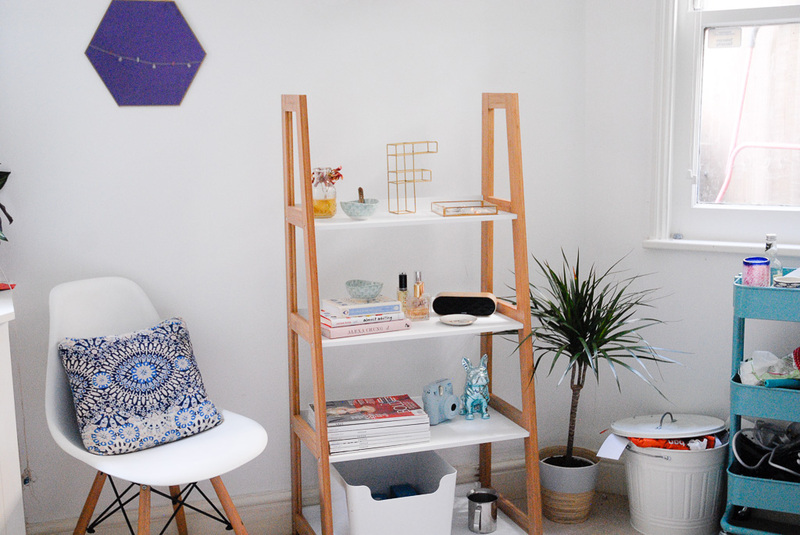 Before all of this re-decoraing madness, I had a HUGE grid shelving unit from Ikea. It was in between my two windows, and not only did it block the light, but it took up the whole wall. The room is pentagon shaped and has five walls rather than just four, so it can be hard to get furniture that actually fits its odd shape. So, I decided to replace it with a much, much smaller ladder shelf from wayfair. 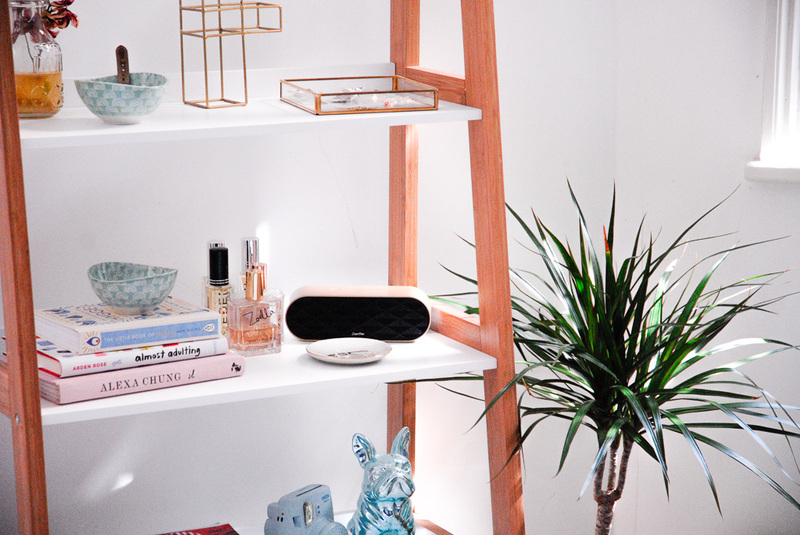 I've decorated each shelve in a minimal style because I didn't want it to look too messy or have too much colour bursting out of it. As for the rest of the wall space, which has been freed up since investing in a smaller shelf. 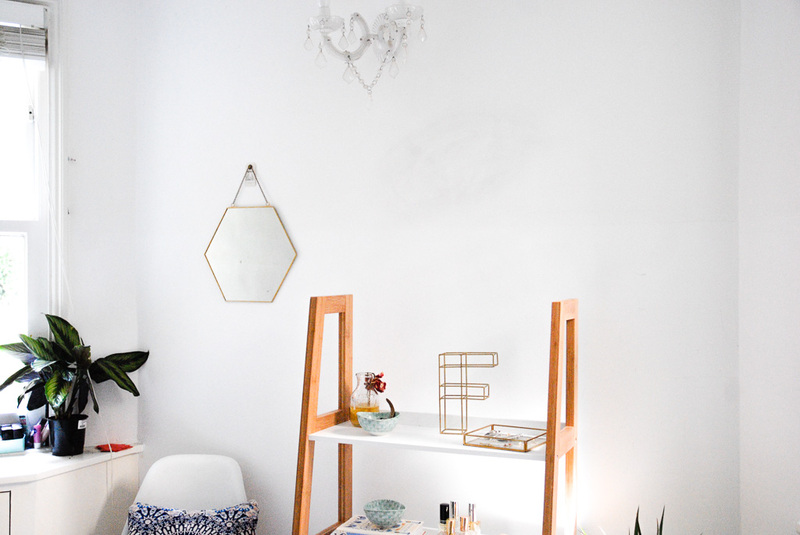 I have a chair in the corner which I've got a cushion on (made from a £2 New look bag) and hanging above, a gorgeous hexagon mirror from my absolute fave for homeware, Oliver Bonas. 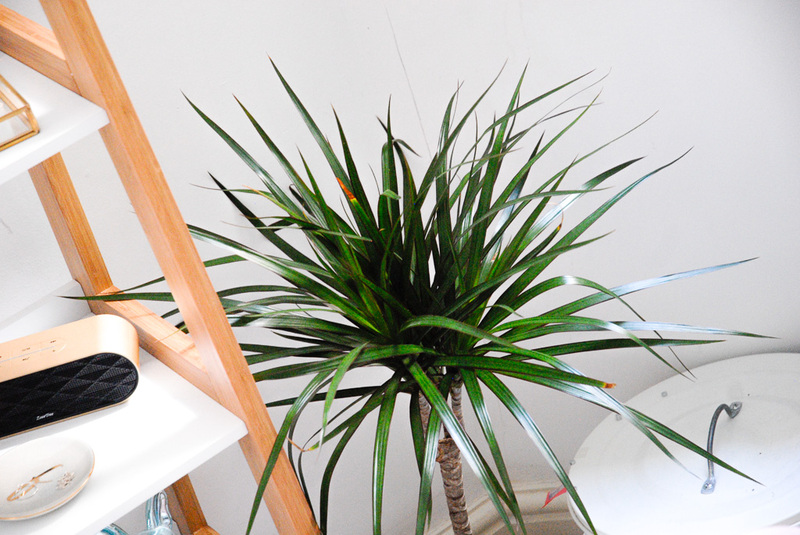 I also have a plant around the other side of the shelves because I thought it would be nice to let the room feel a little more fresh with all the greenery, rather than it feeling cut off from the outside world. 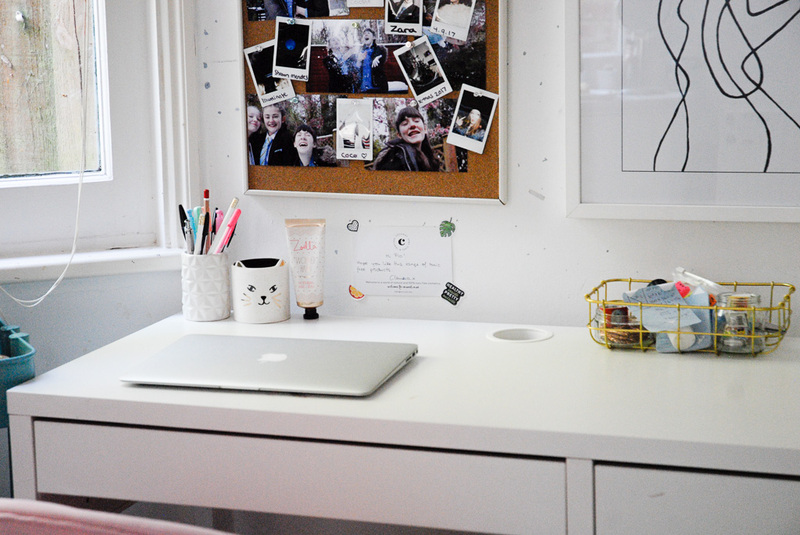 My desk area is definitely my favourite. 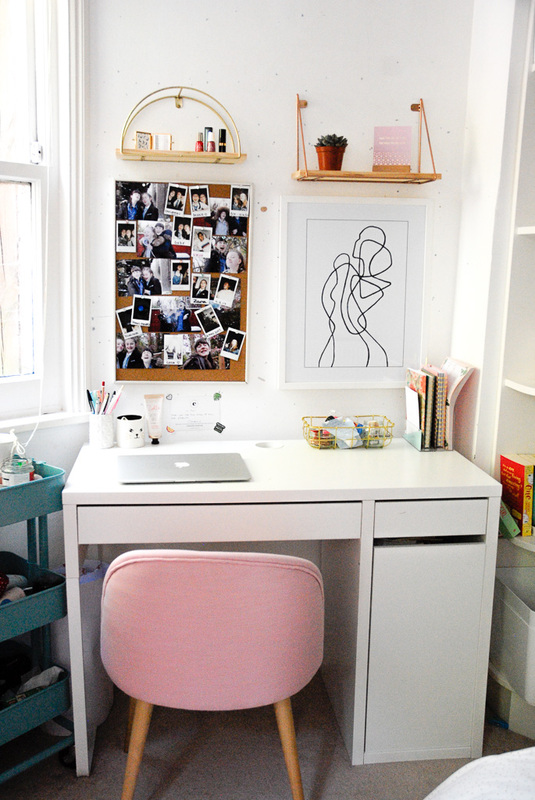 The desk is from Ikea, and I've made up for it's plain-ness with the corkboard covered in polaroids, and the print from Desenio. 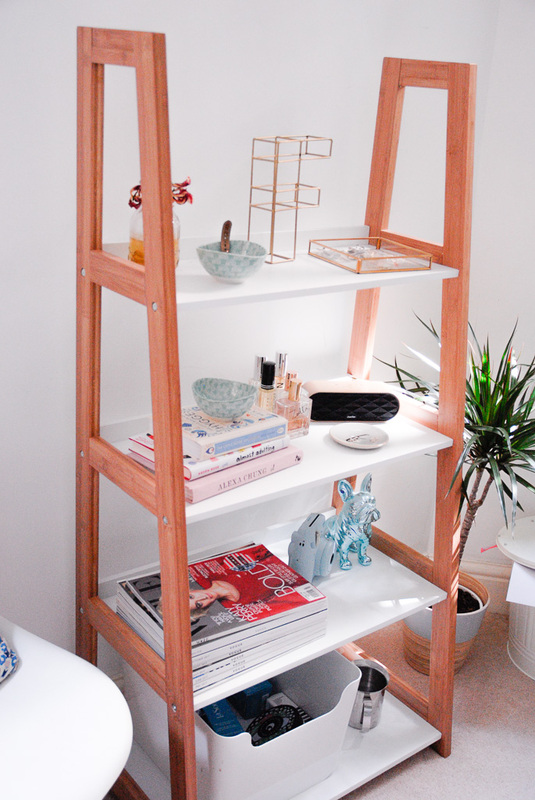 I also found these beautiful shelves on Urban Outfitter for £15, and I fell in love with them straight away. I bought them intending to absolutely cover the copper one with plants, but being my clumsy self I accidentally bought plants that were far too big, so they've been hanging out by the window instead. 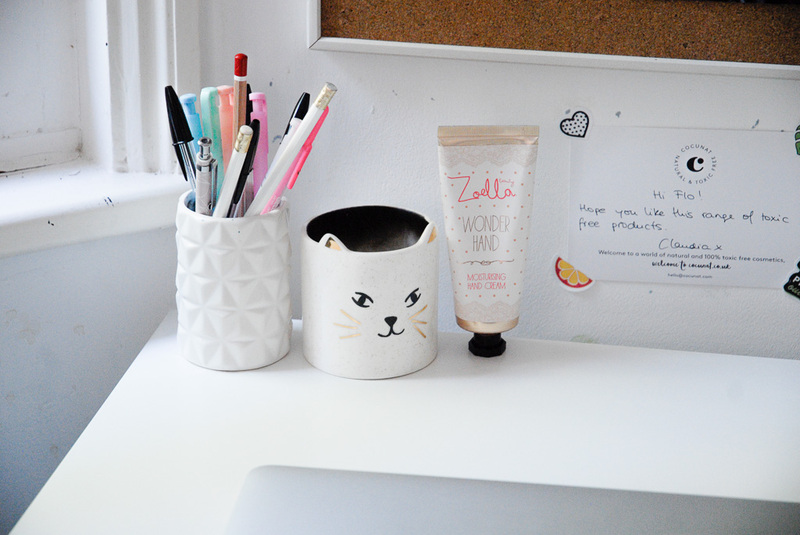 And as for my actual desk, I've got the essentials, like notebooks and pens which I keep in a candle holder which I got from tiger. I've also got the cat candle which I use in ALL my flatlays, from Oliver Bonas and a golden wire paper tray, again from tiger (this time for £2) to hold all my stationary. i totally know what you mean about not being able to sit until your room is tidy! 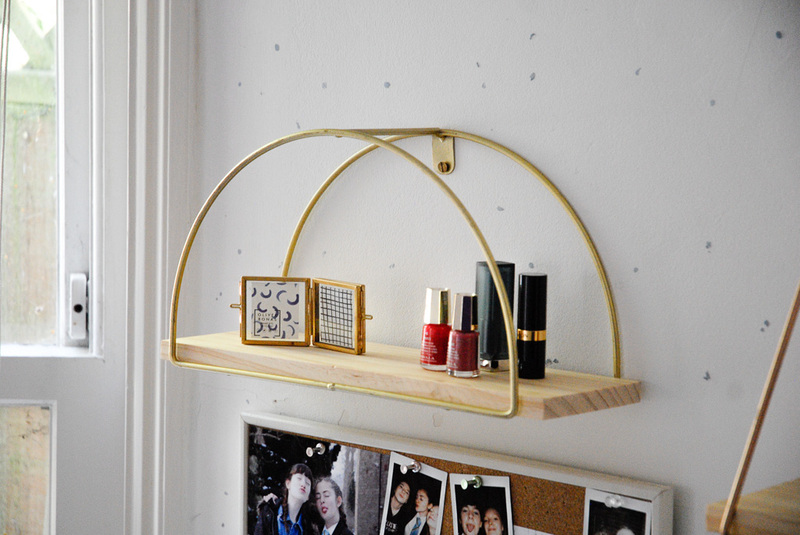 im obssessed with those urban outfitter hanging shelves! p.s check out my brand new blog post about my fave pamper products! ah I love your room! So bright and pretty! Making me immediately want to change mine! 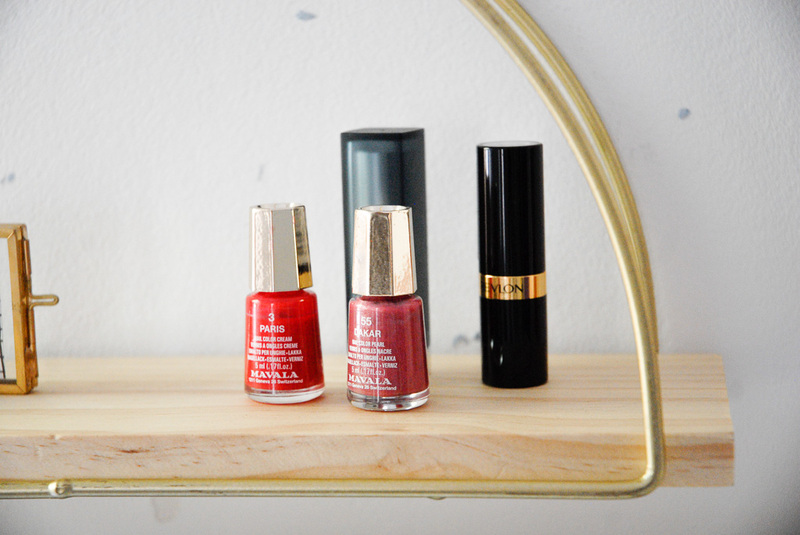 I just love the little shelf and how you decorated it! 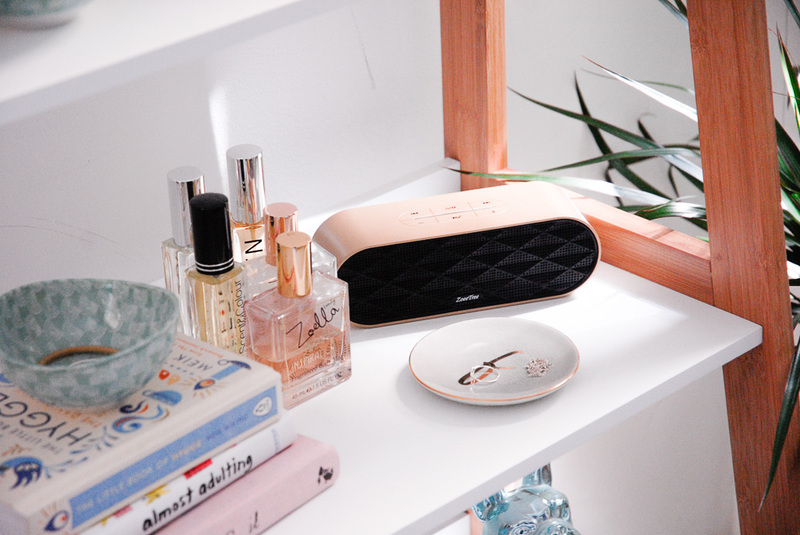 Your room looks gorgeous, so neat, tidy and stylish. Even on a good day my room doesn't come close to looking like that. You've created such a beautiful space! 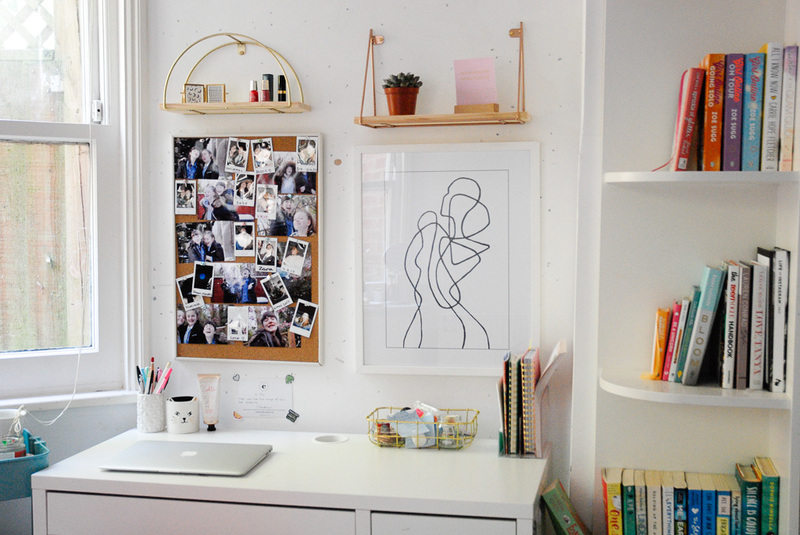 Thank you for sharing photos - they belong on Pinterest; such brilliant interior inspo!